For some reason, Disney now seems to be adamant in remaking their beloved animated hits into live-action movies. So far, we’ve had 101 Dalmatians almost twenty years ago, Tim Burton’s notorious failure Alice in Wonderland, last year’s Maleficent which re-spun their Sleeping Beauty, and in the pipeline we’ll have live-action versions of Beauty and the Beast, The Jungle Book and – of all things – Dumbo. Aside from the obvious financial reasons, there’s no real need to fix what isn’t broke. Those classics are considered classics for a reason, and anyone who grew up with them may find themselves perplexed by the thought of a new live-action version that they don’t necessarily need. That brings us to Cinderella, the latest in Disney’s current trend, which upon its debut has been met with hostile divisiveness among fans, mainly for the reasons we have outlined. One corner is kinder to the film, saying that while the film doesn’t necessarily do anything new with the story, it’s still an impressive and handsome interpretation regardless. The other corner, on the other hand, has bombarded it with criticism about how it does nothing new with the story, how bland everything and everyone is written (particularly the titular character, played here by Lily James), and how, in a post-Frozen world, it takes a large step backwards in its portrayal of feminism. Both sides of the argument are understandable, but in the end we have to decide which side to fight in. For us, it’s the side that’s more in favour of the film – for some interesting reasons. Regardless of whether we liked it or not, there is the overbearing fact that this is a very straightforward version of the fairy tale. Almost beat for beat, everything is intact – Cinderella is reduced to a servant girl by her evil step-mother (Cate Blanchett, revelling in the theatricality) and bratty step-sisters (Holliday Grainger and Sophie McShera), the scene where she meets her fairy godmother (Helena Bonham Carter in full Helena Bonham Carter mode), the ball where she meets the Prince (Richard Madden, bringing a surprising amount of personality to his part) and, of course, the denouement with the iconic glass slippers. This is a very traditional take on the story, which has received the spite of many fans who decree that it prevents the movie from having any real purpose, outside of just making Disney a bucket load of dough. In some respects, that is a fair statement; the fact that it doesn’t bring anything new to the table does undermine its existence. But consider this: director Kenneth Branagh, coming off Thor and the underwhelming Jack Ryan: Shadow Recruit, has also been renowned for his multiple Shakespeare adaptations, most notably Hamlet. The work of Shakespeare is, to many, untouchable when it comes to adaptation; whether you set it in a historical setting, as Branagh did with Hamlet, or update it to modern times like Baz Luhrmann did with his version of Romeo and Juliet, the story and (in some cases) the dialogue stays exactly the same. If anyone were to rewrite any of his work to a point where it’s unrecognisable, it would be considered sacrilege. With his Hamlet, Branagh decided to keep the play in tact right down to its historical setting, and though this resulted in a film that was four hours long it was clear that his high respect for the source material was present. Same thing with Cinderella; by taking a more traditional approach to the story, he shows his respect for how much it means to people who have grown up with it and taken it to heart, and that to radically alter what was already beloved would encourage the wrath of its fans even more. Now, does this justify the project’s existence at all? Not really, but it does attempt to at least explain the reasoning behind making a version of Cinderella that sticks closely to what it was rather than going a whole new direction. Another area people are so riled up over is the depiction of Cinderella herself. “She’s not a strong character”, they say. “She’s so passable and hardly stands up for herself.” Fair enough, but to the film’s credit she was exactly like that in the original animated film as well. Amidst all the mistreatment she suffers she just takes it on the nose, and the only time she actually does stand up for herself is nearer the end. Disney’s Cinderella was never the end-all role model for empowering young girls, in adopting the Snow White mantra of “Someday My Prince Will Come” – here represented by the mantra of “have courage and be kind” – which basically means that if you just wait around and do nothing, good things will come to you. James, for all her charm she brings to the role, is still saddled with this type of character, and even though she shares good chemistry with Madden’s likeable Prince she is somewhat restricted by the limitations that come with Cinderella. It’s likely that in the aftermath of the smash hit that was Frozen, people were disappointed by this film’s lack of female empowerment or appropriate role models. Again, though, this is a very traditional and old-school approach to the fairy tale, so whatever you may think of the overall character it all boils down to Branagh’s respect for the timelessness and purity of the story, including its main character as it was originally written. If there’s one thing everyone can agree on, however, is that the film looks absolutely BEAUTIFUL. Branagh has been known for his extravagant designs in his films, and this one is no exception; everything from the sets to the props (including the infamous pumpkin carriage, here given a golden makeover) is stunning to look at, especially Sandy Powell’s exquisite costume design (Cinderella’s blue ball dress is a small work of art) is sure to end up in many awards shortlists in a year’s time. Haris Zambarloukos’ cinematography brings an extraordinary pallet of colour to every scene, making this a true delight for the eyes. 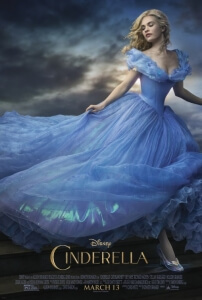 Cinderella is destined to be a divisive movie; anyone going in expecting a revisionist and post-Frozen rejuvenation of the classic story will likely walk away disappointed, but for anyone who wants a reminder of the power of a traditional fairy tale, by Disney no less, then Kenneth Branagh’s respectful and visually-gorgeous adaptation will fit perfectly.